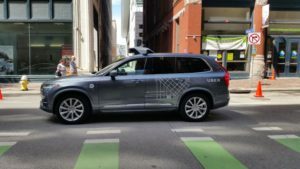 Tempe, Ariz., authorities reported Monday that a self-driving Uber vehicle struck and killed a woman crossing the street on Sunday night. “It was in autonomous mode at the time of the collision, with a vehicle operator behind the wheel,” Tempe police said in a statement. Self-driving vehicles typically do have a human driver present during testing, though California will allow the vehicle to operate without anyone inside starting April 2 if the owners can still take over remotely, the New York Times reported. The pedestrian, Elaine Herzberg, 49, was traveling west to east “outside of the crosswalk” in the vicinity of Curry Road and Mill Avenue, police said. The Uber test vehicle was driving northbound south of Curry Road. Herzberg died at a local hospital. Authorities responded at about 10 p.m. Sunday. “Uber is assisting and this is still an active investigation,” Tempe police wrote. Tempe police didn’t disclose which make, model and year of vehicle was involved. Uber halted its self-driving testing in the Phoenix, Ariz., area as well as Pittsburgh, Pa.; San Francisco; and Toronto, Canada, which is its SOP. The National Transportation Safety Board said it would investigate the collision. Arizona Gov. Douglas Ducey on March 1 signed an executive order that allowed SAE Level 4 or Level 5 “fully autonomous” vehicles to test or operate on Arizona roads without a person inside if certain conditions were met, including complying with all federal and state laws. If such avehicle were suddenly unable to drive itself, it must “achieve a minimal risk condition,” defined basically as stopping itself safely. The Arizona Department of Public Safety must develop a protocol about how police and other first responders should deal with autonomous vehicles, and self-driving car operators must develop a plan for complying with that protocol, according to Ducey. Autonomous vehicles are seen as a means of reducing large numbers of traffic crashes — which obviously matters to collision repairers. But this can’t happen without regulators and lawmakers approving their existence. It’ll be interesting to see if this is another instance where an autonomous vehicle crashes in a high-profile manner — only to be found not at fault after all — or if the artificial intelligence should have performed better, even with the Uber driver inside as a hedge. It’ll also be interesting to see if the crash could be attributed to the 10 p.m. time of day. While certain sensory technology such as radar and LiDAR ought to work fine at night, cameras might not fare as well.